I heard from jazz bassist and composer Lello Molinari after my review of The Italian Job, Vol. 2. He thanked me and shared a link to the wonderful video he made on the recording of "Intermezzo Sinfonico." You can watch it here. Enjoy! This one can be summarized thusly: a horn player and electric guitar player get together and perform Ukrainian folk songs that have been adapted into jazz pieces. You can almost stop right there and have a pretty good idea of what this album sounds like, and whether you'll like it or not. But you would be cheating yourself by not sitting in on these sessions and experiencing all the feeling behind the music. 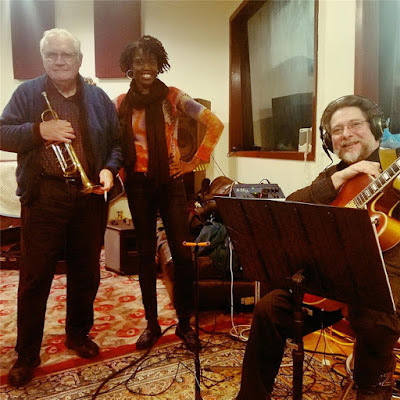 Bob Arthurs, a well-known trumpet and flugelhorn player, has teamed with the mellow electric guitar jazz of Steve LaMattina, and both are extremely astute in these interpretations. Until you sit and listen, however, you'll know nothing about the heartfelt longing that rises off the surface of this music like an early morning mist on a quiet lake. Each one of these songs tells a specific story, even when there are no words. (Arthurs sings on five out of the eleven tracks.) You'll feel like each melody is a history lesson, a window into another time and place. 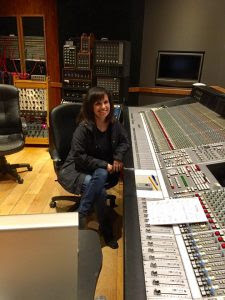 The entire project was the idea of producer Irena Portenko, who is indeed from the Ukraine. The titular trio of fathers belong entirely to Irena--her father, her uncle and the father of her daughter Anastasia. She also alludes to her beloved homeland as a father as well. 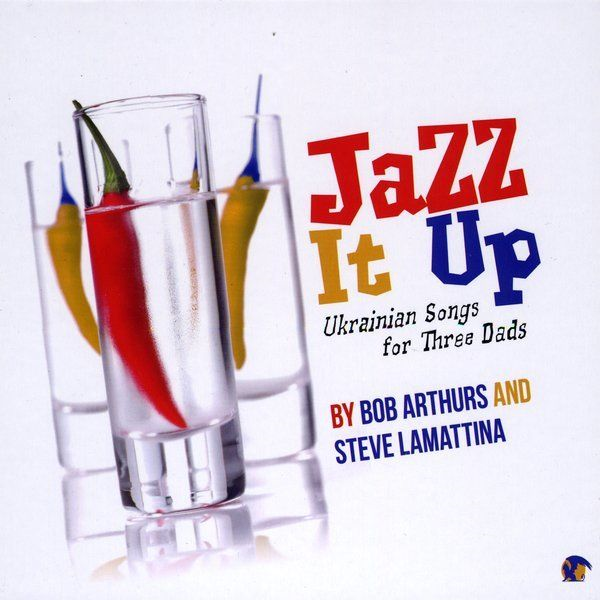 Portenko collected a number of Ukrainian folk tunes and sent them to Arthurs and LaMattina and asked if they could play them in a jazz context. While the two performers only had a couple of days to record all of these songs, there is nothing that sounds rushed. "They are very beautiful songs," Arthurs says, and it's clear these unusual and lyrical pieces would stand on their own no matter how they are interpreted. That means these songs tend to step out of their jazz trappings more often that not. 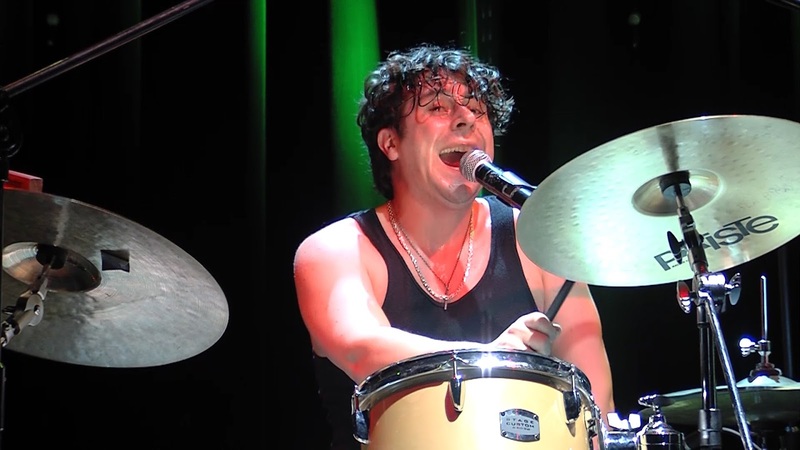 Perhaps a rhythm section might have anchored these performances to that genre in a more specific manner, but there are plenty of moments where the duo sticks to the core of the song--the basic melody, the tempo and all of those distinct Ukrainian touches. LaMattina can deliver the rhythmic support with his relaxed strumming--he's very precise in a affable way. That's where this music connects to jazz. But so much of it is tethered to the spirit of those original songs and those very strong feelings. It's a balancing act, and it's accomplished with considerable skill. Kudos also go to Portenko the producer. It's not hard to bring out the natural sound of two performers on the stage, but she adds just a slice of atmosphere that delves into her own sense of nostalgia. There's plenty of sonic interaction between the instruments and the studio that's rich and thoughtful. The execution of Jazz It Up is what's so fascinating--on the surface it's two guys playing quiet and intimate jazz, but as you pull away you see the inspiration supplied by Portenko and ultimately the experiences and histories of an entire nation located on the opposite end of the globe. From a contemporary jazz standpoint, Sean Noonan's pretty weird. Part slam poet, part folkie and all drummer, Noonan creates the kind of free-form music that might not play with audiences who are looking for the next great jazz percussionist. But I suspect music this original and quirky might find a home with indie rock fans who might be looking for an interesting entry point into the world of jazz. To give you an idea on just how "different" Noonan is, I refer you to his press kit which describes his approach as having "the locquacity of an Irish band, the narrative rhythms of Samuel Beckett and the raw physicality of a street-smart boxer." 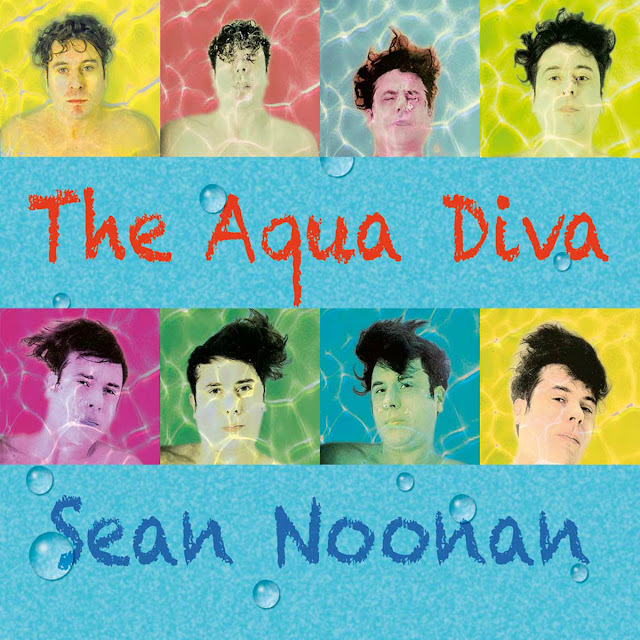 After listening to his latest album, The Aqua Diva, I imagine him as a kindred spirit to Mike Myers' character in So I Married an Axe Murderer, only behind a drum kit. Like Charlie MacKenzie, Noonan chooses an adept and deadpan jazz trio as his muse. Pianist Alex Marcelo and bassist Peter Bitenc are both quite serious when it comes to exploring a wild yet fully relevant rendering of be-bop, yet they're both in cahoots with the fey and slightly anarchistic tendencies of the drummer on stage. They're the anchors to this musical looniness, but they're also quite aware of the literate meanings behind the silly veneer. Noonan uses plenty of pop-culture themes in his original compositions such as Don Knotts (which is adapted from a variation on Conlon Nancarrow's experimental 12-tone themes), but he also knows how to mine reverence from traditional Irish folk songs such as "Wayfaring Stranger." He's a fan of both Frank Zappa and Edgar Varese, and those influences are mulling around in this album and waiting to be noticed. If this sounds interesting to you, it will be. Noonan doesn't have the kind of singing voice that jazz fans will respond to, as I've already suggested, but that's not the point. Noonan does have a flair for the theatrical, and he likes to make grand gestures that are framed in moments of sheer absurdity. If his postmodern sound--and I use that term rather loosely--doesn't appeal to you on first listen, you can always take a detour to the musical side and focus instead on what the musicians are doing. Marcelo is versatile and quite lyrical on his piano and he can easily draw you in and convince you he's an extraordinarily gifted jazz musician--after all, he played with Yusef Lateef for many years. Bitenc is solid on bass, straightforward and calm in this sea of flittering ideas. Noonan's skills on drums are also evident. He owns many tempos and styles and can stop on a dime. You can imagine him performing solo, with just his singing and his kit, and you might deduce that listening to an album of that alone would be worthwhile and you'd probably be right. Then again, I'm grateful for the presence the other two provide because this hyperactive idea of an album gives you so much to chew on. Noonan, after twenty releases, thrives on collaboration and has recorded with a wide range of talented musicians such as Malcolm Mooney (the original singer of Can), guitarist Marc Ribot and Mali's own Abdoulaye Diabate. The Aqua Diva is not for everyone, but if you love the sense of overflowing quirkiness combined with real musical chops you'll probably dig this a lot. 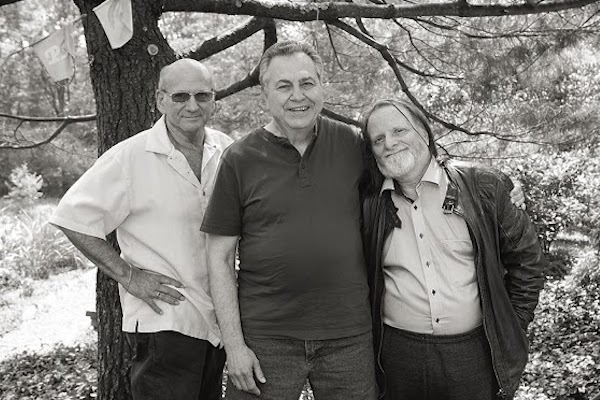 A few months ago I reviewed a trio of male jazz singers, and I knocked these gentlemen for having voices that were a little too light, a little too classically pure for jazz. These three, and a few others I can think of, are fantastic singers and deserve to have flourishing careers, but each one needed, for different reasons, to find material that better matched their voices. They hadn't been roughed up enough by life to really sing the jazz they'd recorded. Fred Farell doesn't have that problem. Now in his fifth decade singing jazz, Farell knows the right balance of weariness and wisdom required for an effective jazz ballad. On Distant Song, his first release for the new Whaling City Sound label, he's teamed up with with horn player Dave Liebman and pianist Richie Beirach to deliver ten original songs that are imbued with the sadness and longing that comes from singing a lifetime's worth of jazz. The idea here is fairly simple--Liebman and Beirach compose the music, Farell supplies the lyrics. In other words, this is a very personal project for this trio. You can hear it in every word that's spoken, and every note that's played. There is an interesting fourth member of the team here--the studio. I'm not sure if this is the Whaling City Sound's signature or not, since this appears to be their third release (catalog number wcs 103), but it is distinctive. 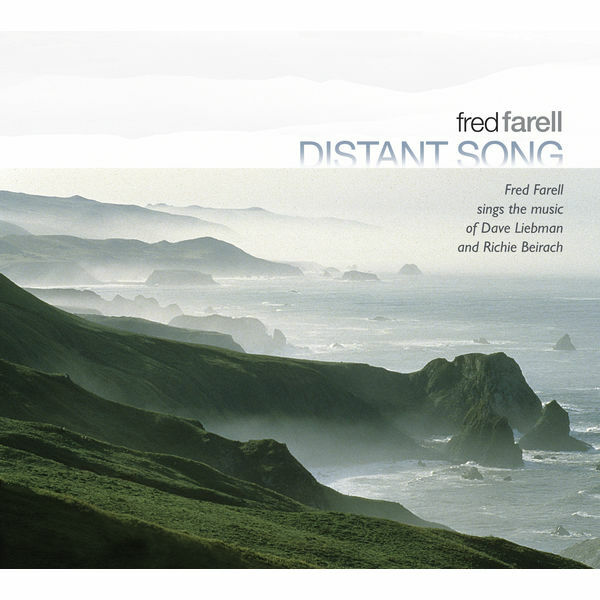 Farell's voice does indeed sound distant and cavernous, as if his performance was captured a long time ago. It's soaked with echo and reverb, which magnifies that slight wavering in his voice and underlines the aforementioned weariness. I'm sure it's an intended effect, and it's a valid choice, but it does take a little bit of time to adjust to it--especially when the keyboards and horns are so clear and present and forward. When it comes to intimate trios like this, I prefer the sound to bounce easily between the performers and even reflect what the others are doing...even when they're not doing anything. That sensation is minimalized here. But that's not a flaw. It's just a different perspective, a conscious choice to make an elegy sound like an elegy. Distant Song isn't a happy or energetic album. It's a solemn one, full of longing and regret. All three of these gentlemen seem to know these emotions inside and out, and there's absolutely no pretense to be found. There are plenty of times where you need an album just like this one. Be-bop was my entry point into jazz so many years ago. I was thrilled with its freedom, its ability to set up beautiful themes and then deconstruct them in each and every round. I was in awe of musicians who could stand on a stage and go places no one else had ever been before, and yet every step taken was logical and familiar. For years that was the only type of jazz I listened to, and my first jazz albums were all primers to the art form--Miles Davis, Dave Brubeck, Art Pepper, Ben Webster, Sonny Rollins, Archie Shepp and many others, the wilder the better. Not chaotic, mind you, but wild and untamed. 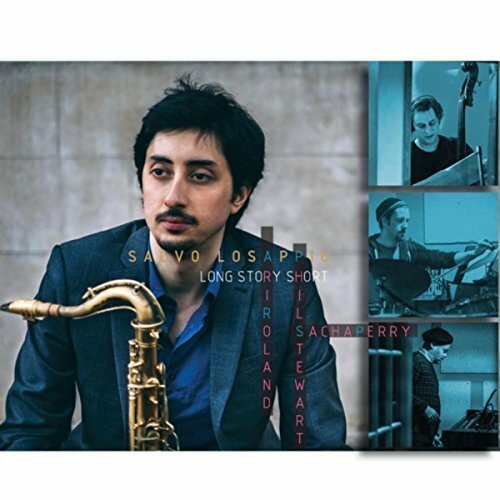 Salvo Losappio's new album, Long Story Short, takes me back to those early days of my musical education--mostly because I've simultaneously broadened and smoothed out my comfort zone over the last few years. Losappio's a tenor sax player who was born in the south of Italy in 1989, the same era where I was first introduced to my be-bop heroes. He's a kid, I guess, but from the way he plays he has a very old soul, one that ripened in the late fifties and early sixties. 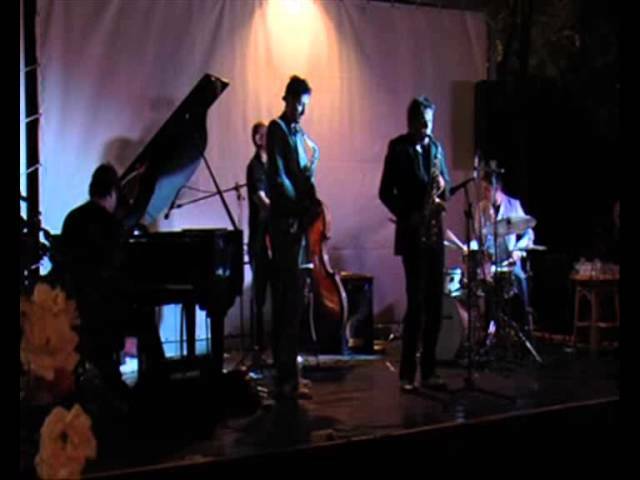 I know that describes a lot of young emerging talent in contemporary jazz, but there's a difference with Losappio. He means it down to the very depths of his being, or at least he sounds like it. This mix of standards and originals is real to the bone. Losappio and the others in his quartet--pianist Sacha Perry, bassist Ari Roland and drummer Phil Stewart--play with that devil-may-care attitude you hear in real be-bop, that sense that every moment exists in a tidy structure and yet the spaces between the mileposts are prone to spontaneous combustion. This is jazz for darkened stages, where the night is getting long but no one dares to go home because they might miss something, a certain feeling that smells like cigarettes and napkins soaked with spilled cocktails and someone's about to set the whole mess of fire right at the edge of the stage. While Losappio has a deliberately quick and clipped delivery on his horn and runs scales like a madman, he is generous with his fellow musicians and allows them plenty of space to demonstrate that they can play anywhere, anytime. That adds to the sense of unpredictability. There's not a lot of specifics to dig into with pure be-bop like this. It's about feeling and where you wind up emotionally and intellectually at the end of the song. I will point out Ari Roland's fondness for the bow and how he can remind me, in fleeting moments, of Ray Brown. But other than that, this is where you detach from the world and soak yourself in a sound that will energize you from head to toe if you have an open mind. Jazz guitarist Dave Stryker has been a busy guy. Not only have I reviewed two of his albums, Eight Track II and Strykin' Ahead over the last year or so, he's appeared on a lot of other musician's albums such as Steve Slagle's Dedication. Just yesterday I reviewed McClenty Hunter Jr.'s wonderful new album, The Groove Master, and Dave Stryker co-produced that album and played guitar on a song or two. 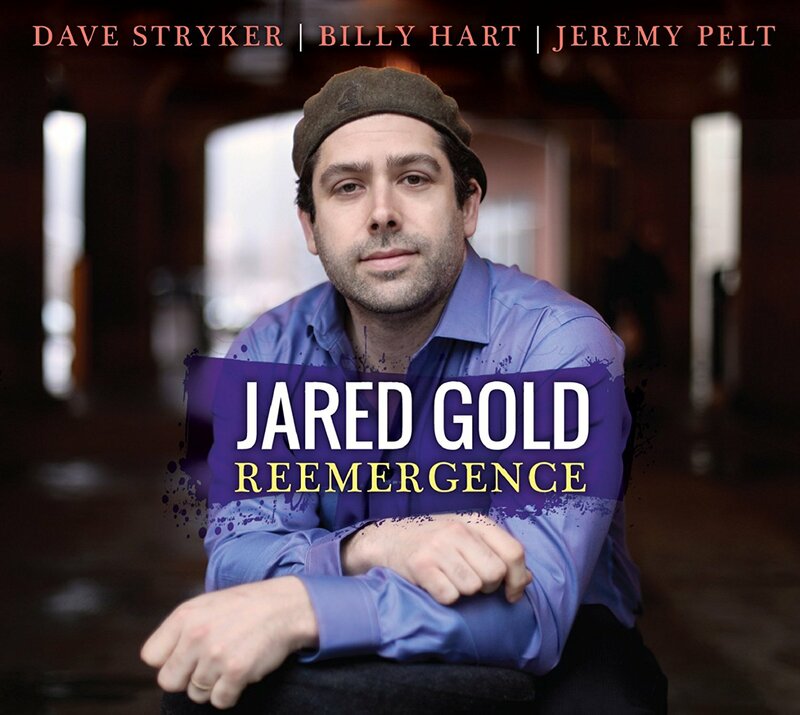 On Jared Gold's new album Reemergence, Stryker also plays a huge role--he plays guitar on all tracks and he produces. Oh yeah, this album is released on the Strikezone Records label, just like Hunter's. No wonder I received both CDs in the same padded envelope. As with Hunter's album, Reemergence isn't about Stryker, although his influence is felt more here. Gold plays none other than the Hammond B-3 organ, which has become a major theme for contemporary jazz over the last couple of years. (Or perhaps its presence has been felt for much longer--and I'm just starting to notice and I'm totally digging this renaissance for the instrument.) Reemergence is more lively and brash than Hunter's somewhat moody and thoughtful album and is more consistent with the more rambunctious tone in Stryker's albums. I'm talking, of course, about that Paul Schaffer-esque sound where the guitars and the organ drive the melody in an upbeat and lively manner. That doesn't sound surprising for the organ to take the lead, obviously, but I have heard B3 players sneak around in the background and provide enormous amounts of texture between solos. Gold is up front, taking turns with Stryker and horn player Jeremy Pelt. Drummer Billy Hart comprises the rhythm section along with Gold, who is working sans bassist and is covering the deep notes with the floor pedals. 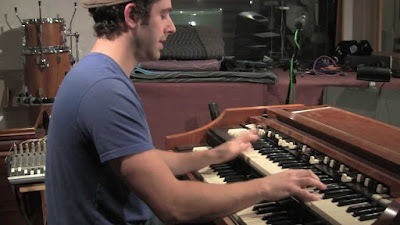 Working without a bass player isn't unique in the world of jazz (or even rock, as Ray Manzarek will tell you), but it does underline the virtuosity of this type of B3 player. Unlike Hunter, who played patiently for years before stepping out in front, Gold is an old pro when it comes to making records--Reemergence is his eighth solo album, and he's been featured on many, many others. 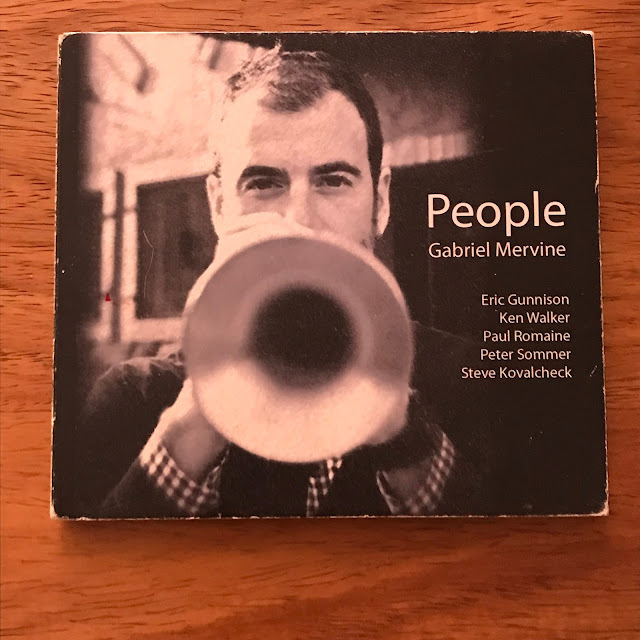 He has extraordinary taste when it comes to his covers--Gershwin's "It Ain't Necessarily So" and "How Long Has This Been Going On," Ornette Coleman's "Blues Connotation," and even Lennon and McCartney's "She's Leaving Home," which has been totally transformed by the original. It took me a while to place it. He takes a cue from Hunter by covering Stevie Wonder's "Looking for Another Pure Love," which feels like a specific suggestion from Stryker. Gold throws in a couple of exciting originals before paying tribute to Stryker by ending the album with "Nomad." 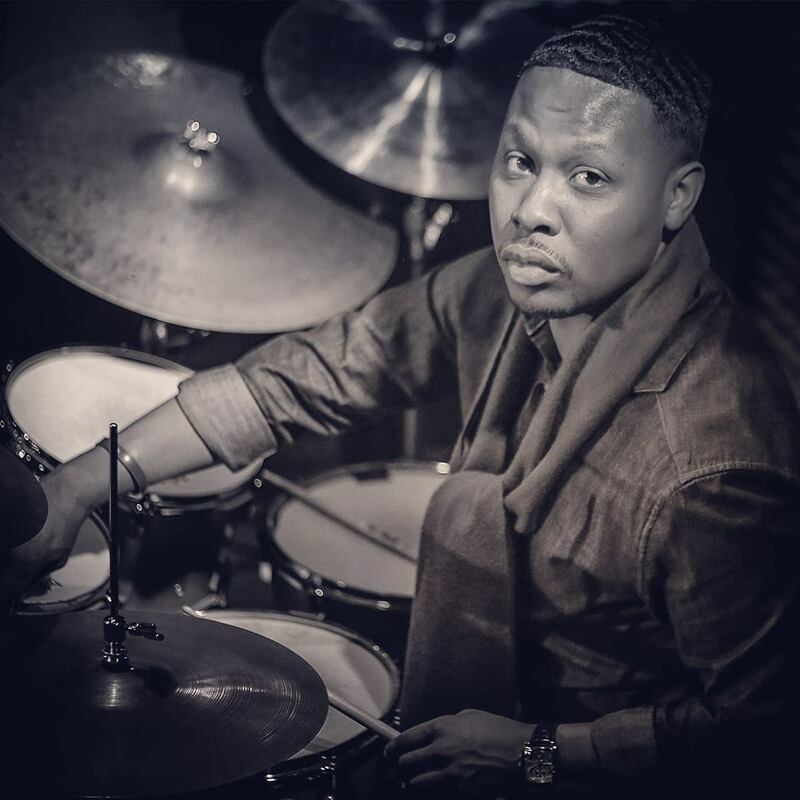 Stryker has become quite a creative force in contemporary jazz, and he's doing it by lifting up his colleagues and friends and showing the world what they can do. Both The Groove Hunter and Reemergence are strong releases, standouts in a still young 2018, and I look forward to more introductions like this from Strikezone Records. What do you want to know about this McClenty Hunter Jr. fellow? That he's been a big part of the New York City jazz scene over the last decade? That he's one of those contemporary jazz drummers who's also a composer and arranger, which sounds rarer than it actually is? 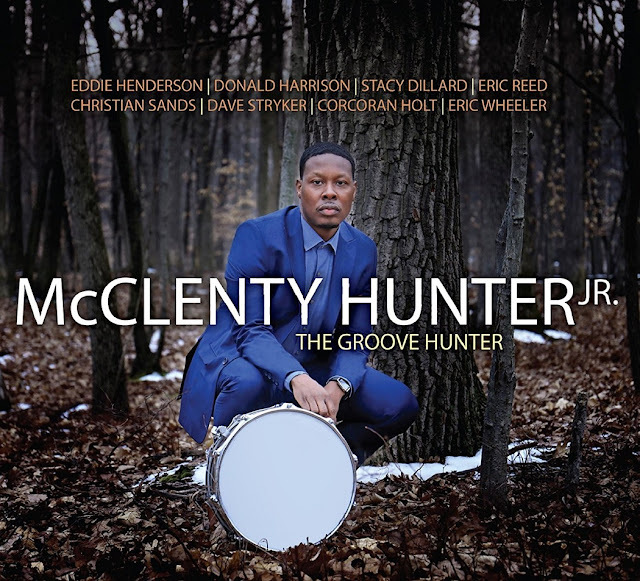 That talented jazz guitarist Dave Stryker took McClenty under his wing and taught him a few things about production and decided that this new CD, The Groove Hunter, would introduce an original, exciting new force to the world of jazz? I'm sure all of that is true, or at least partially true. All I can tell you is that I stuck this in my CD player, pressed play and immediately said "wow." Hunter, who has played in Stryker's trio for the last eight years, has put out a classic jazz album. By classic I mean old-fashioned, something Rudy Van Gelder might have recorded fifty years ago. That's surprising since Stryker is a thoroughly modern jazz performer. He can do classic as well, but he's more comfortable in his own space playing a mean and edgy electric guitar in order to create a jazz that's just a few doors down from the blues. But The Groove Hunter is different. Perhaps it'll remind you of Cannonball Adderley's Something Else, all soft and lyrical in its inspiration. Perhaps Stacy Dillard's up-front sax will remind you of Coltrane or Wayne Shorter. The point is, this is the kind of jazz that sounds like it was discovered in a vault somewhere. It has the Blue Note sound coming out of its pores. I know--this is Hunter's album and not Stryker's, and that's why it sounds so different than Stryker's last few albums. Hunter seems to be a traditionalist, which is what draws this music out from the past. He covers Shorter's "The Big Push," Coltrane's "Countdown" and Herbie Nichols' "Blue Chopsticks" with a proper degree of reverence and even trots out a beautiful version of Stevie Wonder's "That Girl" that might have been covered by one of the great jazz ensembles of yore. He blends in a few of his own compositions in a smooth, surreptitious way that makes it all flow. He does all the right things, and best of all he's the drummer. That means he's keeping time, providing the momentum and letting his cohorts --Dillard, pianist Eric Reed, bassist Corcoran Holt, trumpeter Eddie Henderson and a few special guests including Stryker--take their turn in the spotlight. Listening casually, you might assume that McClenty's playing the sax, or the piano. That's how generous he is with that spotlight. But scoot forward and listen to his percussion. He's soft, he's dynamic, he's the musical center even when he's hanging back. In fact, Hunter is known for the exquisite way he handles the brushes, with shuffle grooves that have deep layers of decay. Fortunately, the recording is wonderful and captures all these details in a sweet, open way. And when Hunter starts letting it rip, your heart will start pounding. This is an exciting album, full of beauty as well as fire; it's old-fashioned in the best way imaginable. Is there any musical instrument that can convey dread, fear and impending terror as well as a horn? Let me elaborate and tell you about the first time I listened to classical music. It was the first or second grade, and our teacher played Tchaikovsky's Peter and the Wolf for us. (Don't ask me which version--I was six years old.) When the wolf first appears, signified by an eerie and menacing melody from the horn section, I felt more than just chills down my spine. I freaked out a little bit. I think I had nightmares for weeks afterward, and the soundtrack for each frightening image in my troubled dreams was the massed sound of those evil horns. It took me years before I could listen to that otherwise beautiful piece of music without feeling like something was waiting in the bushes for me, certain to tear me apart. 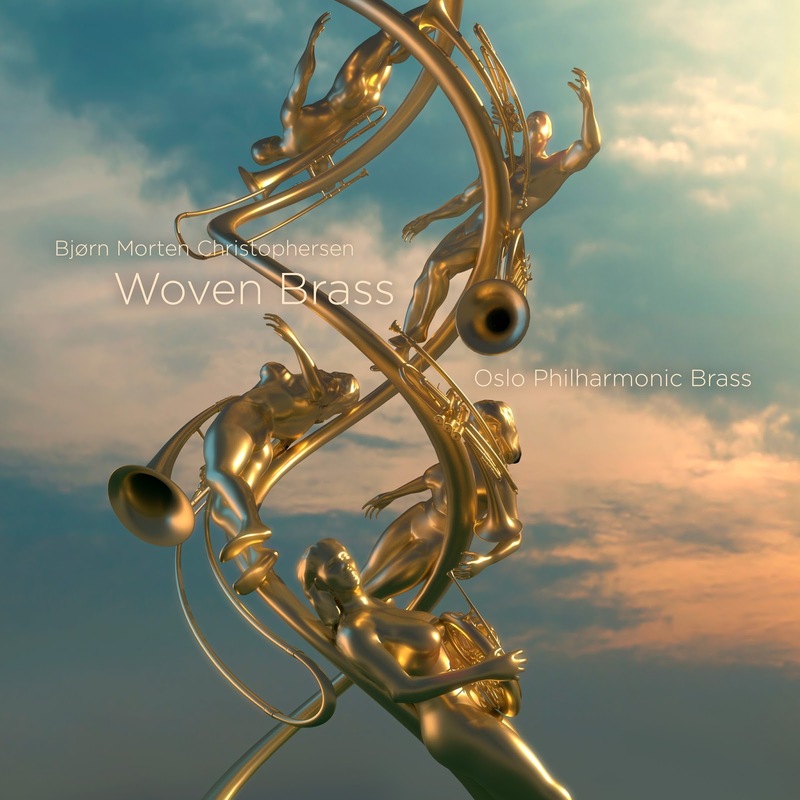 Woven Brass, from Norway's 2L Recordings, has absolutely nothing to do with Tchaikovsky's classic introduction to the orchestra which was obviously aimed at children with more fortitude than me--at least back when I was six or seven years of age. But I can't help but think about that horrible wolf when I listen to these fourteen musical pieces from composer/conductor Bjorn Morten Christophersen. These horns from six members of the Oslo Philharmonic Orchestra create so many razor-sharp moods and images that I can't help being transported back to that classroom in 1968 and feeling those same physical reactions I had to such soul-shattering sounds. I'm not expecting nightmares, but this recording has generated its share of goosebumps. Fortunately, Woven Horns does not sustain those dark, unfathomable fears and emotions for the hour or so it takes to listen. Christophersen's music is thankfully varied and at times it's actually playful--in a vaguely macabre way, that is. The idea behind these fourteen tracks is to allow the listener to digest this music in a number of ways. You can be a purist and listen from beginning to end, or you can take Woven Brass one piece at a time. "Digital streaming services have led to new ways of consuming music," Christophersen explains. While I do think that listening to one isolated piece at a time certainly underlines this point, you'll get more of the recurring themes and ideas if you consume this exciting work as a whole. This is a 2L release where all the recording technology that producer Morten Lindberg employs comes in very handy. 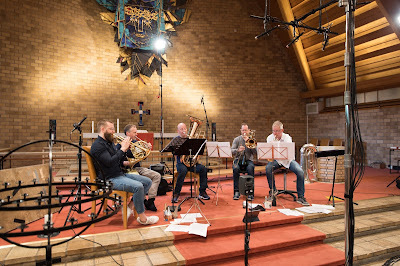 These six musicians (who don't necessarily occupy the stage at the same time) create such swirling patterns of sound in the Jar Church in Norway that 2L's bag of tricks--9.1 Dolby Atmos 48kHz and other surround options, the Blu-ray audio format and MQA, all recorded in DXD 24bit/352.8kHz--is extremely effective in putting each horn in its place on the stage while letting you see the spatial trajectory of every note. You'll be able to track each musician's output with ease, whether it's leader Jonas Haltia's trumpet or the brass from colleagues Axel Sjostedt, Brynjar Kolbergsrud, Jan-Olav Martinsen, Thorbjorn Lonmo and Frode Amundsen. From a sonic standpoint, this is an ultimate reference recording for brass instruments. It will, like all 2L Recordings, test the fidelity of your sound system. But Woven Brass is also a reference for the idea that music can be spine-chilling, so listen with a trusted friend who will make you feel safe! My review of jazz horn player and composer Gabriel Mervine's ambitious trilogy, People, Places and Things, is now live at Positive Feedback. You can read it here. Enjoy! Jazz vocalist Diane Marino starts off her new album, Soul Serenade, with a sound that's a tad too sweet and a tad too MOR. Billy May and Milton Raskin's "Somewhere in the Night" brushes up against "Autumn in New York" a few times, and I immediately started feeling a sense of trepidation, that this was another jazz singer who was going to vex me. It's a good thing I hung in there--Marino's album picks up from that first song and blazes through a set that's not quite a tribute to legendary singer Gloria Lynne but a fond acknowledgement that Marino and Lynne often gravitated toward the same songs. Marino's voice is a sweet thing. It's sultry without the weariness, innocent for jazz but pure enough in its enthusiasm to make you forget about life on the wrong side of the tracks. This goes against my Swagger Rule a bit, but the truth is that Marino's back-up band acts as a serious counterpoint to that classic purity in her voice. The combination of her and her band--which includes keyboardist Brad Cole, drummer Chris Brown, bassist Frank Marino and guitarist Mark Christian and many guests--has a thrilling energy to it that absolutely works, especially as the album moves on through these standards. Yes, Soul Serenade keeps getting better as it goes. Those guests provide more than a few sparks along the way, especially guitarist Doug Munro--his The Harry Warren Songbook which I reviewed for Positive Feedback Online was a major reason I started listening to "hot Parisian jazz" again. He adds that same light magic to a couple of tracks here. The musicians are downright flawless here, and settle in instinctively and provide a new energy from scratch on each track. But it's Marino's voice that slowly won me over. Usually she accompanies herself on piano on her releases, but she relegated that to her close friend Cole so that she could really focus on her vocal style. She's not channeling Gloria Lynne as much as pointing out why these standards are special and were chosen by both singers. "The songs Gloria Lynne recorded during her career stand alone in their originality and uniqueness," Marino writes. As a result, we get sort of a "deep tracks" version of the Great American Songbook with lesser known but compelling interpretations of Arlen & Mercer's "Out of This World," Harry Warren's "Serenade in Blue" and Irving Berlin's "Let's Take an Old-Fashioned Walk." Marino is focused, and she brings out the meaning of each song as few singers do. Settle in with this one, and let it wash over you. Its treasures are revealed slowly, over time. 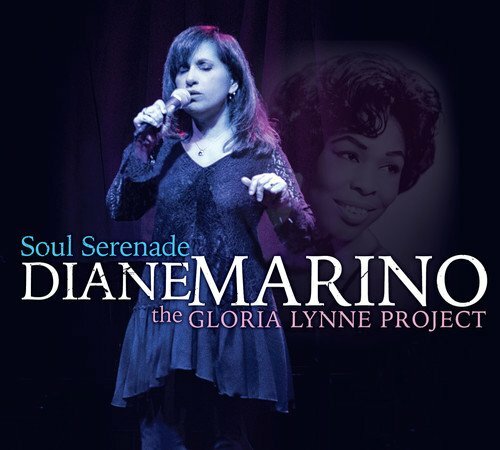 Perhaps you can follow Soul Serenade with a few Gloria Lynne tracks and learn even more about the music Marino is celebrating. The bat swings. Get it? I didn't, at first. This new release has been sitting on the review pile for a few weeks now, its bright yellow cover standing out from others. It took me forever to give it a listen, though. I've been immersed in the world of big band jazz for several weeks now, and this one was postponed for a bit for a couple of reasons--most notably because I just reviewed the Flying Horse Big Band's Big Man on Campus not too long ago and for one cabbage-headed reason or another that was enough to not worry about it for now. 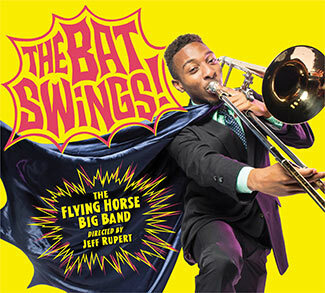 I'm a little sorry that I did wait, because The Bat Swings is exactly what I needed--big band jazz that takes a thoroughly novel idea and runs with it. This is completely different from all those other releases, the ones that feature a mix of standards and originals done the high-impact big band way. This CD, however, is more than the sherbet between the courses. It's a wild and welcome tangent, a big band treatment of all the incidental music from the Batman television series from the '60s. Doesn't that sound like a great idea? That's because it is since the original music was composed by none other than the great Nelson Riddle, a man who knows a little bit about big bands. 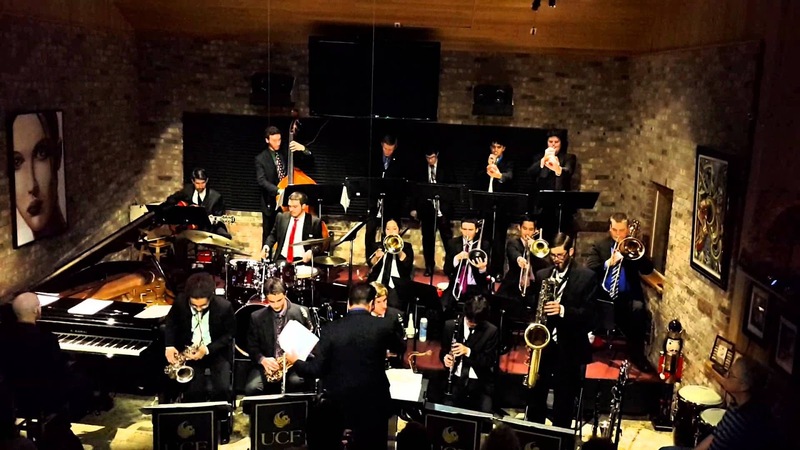 The Flying Horse Band is part of the jazz program at the University of Central Florida and directed by Jeff Rupert. This is relevant because I've been working on that University of North Texas project (I promise I won't mention that again until I'm finished, since it seems to be a form of procrastination to admit I'm still working on it), and I'm starting to compare these college programs to their professional counterparts and trying to find subtle differences. With the last three big band jazz releases I've reviewed right here in this blog, I've felt that the pros sound like they have more composure because they have a little more experience under their collective belt and perhaps there isn't the pressure, a la Whiplash, to perform under an incredible amount of pressure. After a while, instinct kicks in and you just play. But this release sets that idea on its ear since FHBB has that same level of ease and perfection. Most of all, it's surprising how much this novelty succeeds by not surrendering itself to those incredibly familiar Caped Crusader themes. 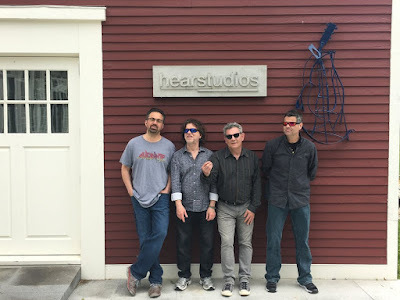 The improvisations and solos keep the kitsch at a comfortable level, especially since they're performed by such talented musicians as trumpeter Justin Diaz, pianist Mudel Honore and guitarist Ryan Waszmer, among others. For fans of the TV show, however, the music is punctuated just enough with those big horn blasts that bat-signal the transition between scenes, or those climactic pows and zaps. If it sounds like great fun, it is, and it's the type of release that pumps energy and originality in a jazz genre that's very much focused on tradition.